We have been living in the house for almost a year now, how time flies. The Genvex Combi 185LS has performed really well, providing hot water and supplementary space heating. 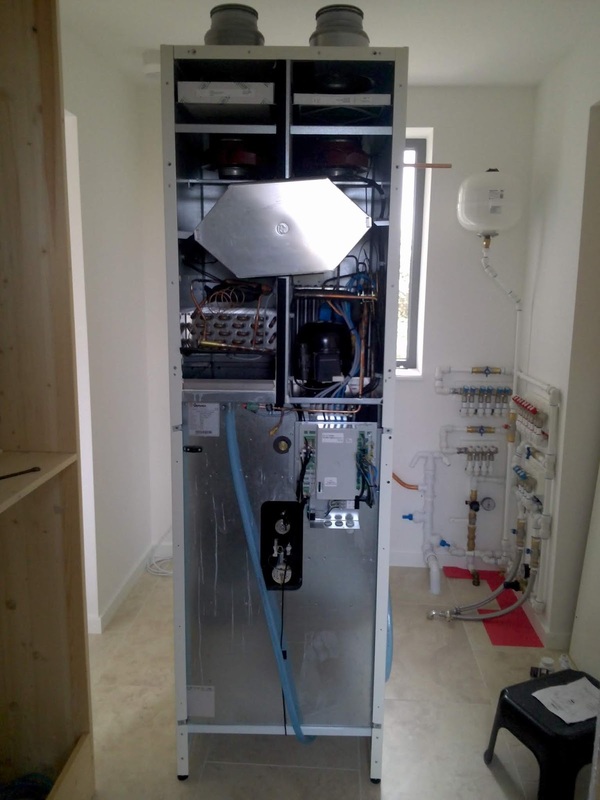 The MVHR system is part of Genvex Combi 185LS. 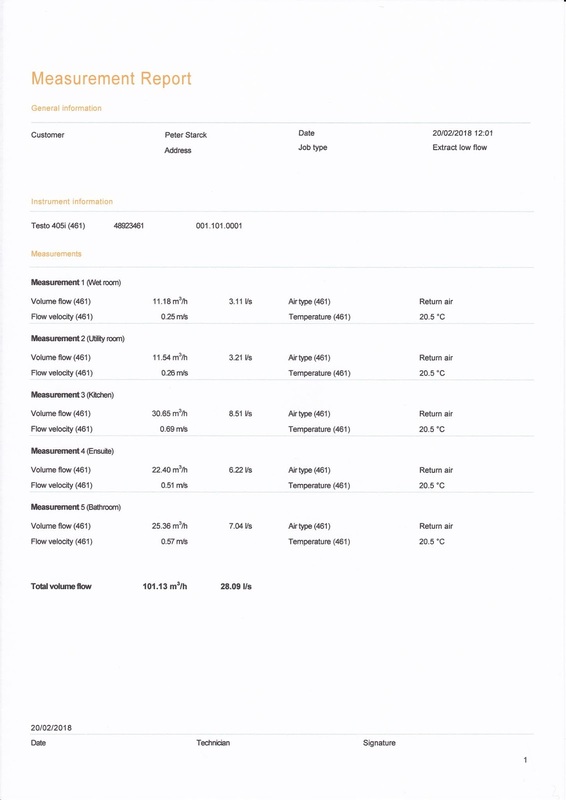 One advantage of the Genvex ventilation system is that having an EASHP built in means that the supply air temperature is always slightly above room temperature even if it is not in heating mode. A standard MVHR unit would deliver air at a few degrees below room temperature, hence feeling cool, unless a post heater were fitted. I recently realised I had forgotten to write up the process we went through when setting up the ventilation. 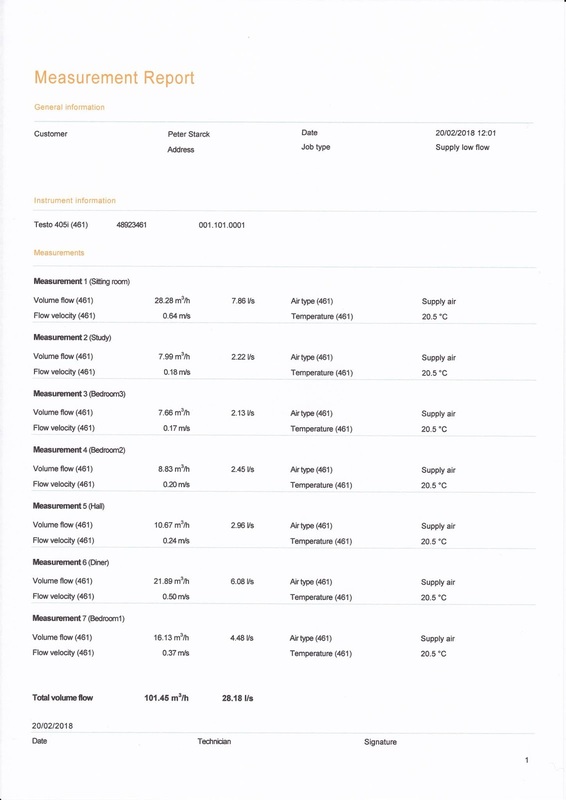 When we commissioned the ventilation system we set it up for the building regulations rates which were quite high. After the house had been signed off we changed the air flow rates to Passivhaus levels. The Genvex has four ventilation levels and the speed of the supply and extract fans can be altered for each level making it relatively easy to balance the system. To set the flow rates I used a Testo 405i anemometer fitted into a piece of flared ducting held over the supply or extract valve. The Testo 405i has a bluetooth link to a portable device running an app which stores and outputs the results. This makes the process much easier than having to write down results each time. 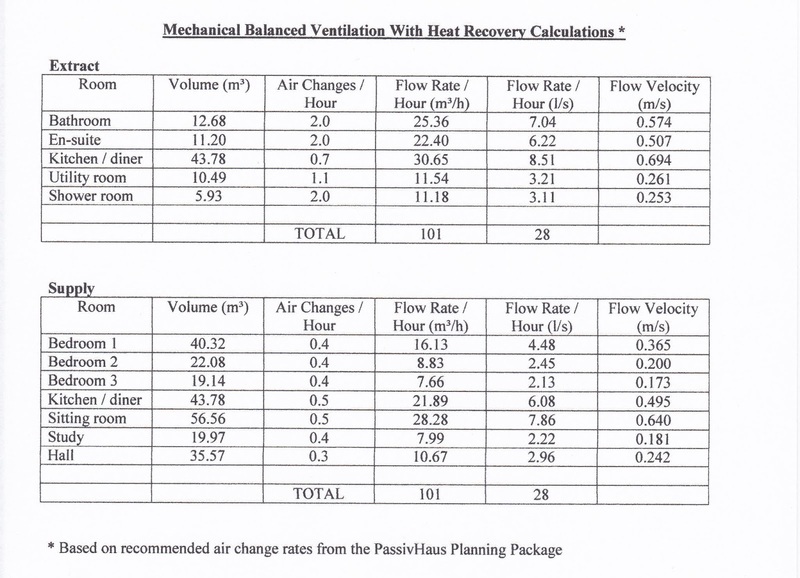 I created a table of room volumes along with Passivhaus air change rates and from that calculated the flow rate and hence flow velocity. I then adjusted each of the room valves for the extract side starting with the room closest to the Genvex unit and then the next room further away until all the rooms were finished. This process was then repeated along with adjusting the fan speed until the required flow velocities were correctly set up for each room. This was then carried out for the supply side. We found that the set up procedure was very sensitive to wind speed, so we carried out the commissioning on a calm day. It will come in very handy when we get to this stage to be able to go through the process step by step.